Champions Yorkshire struggled to 241-9 on day one of their Division One match against Somerset at Headingley. After the hosts slipped to 32-2, Alex Lees (83) and Joe Root (35) put on 63 for the third wicket in 18.2 overs. But Yorkshire found it tough going as Peter Trego took 3-66, while Alfonso Thomas and Tim Groenewald finished the day with two wickets each. Jack Leaning (50no) and Jack Brooks (16no) put on an unbroken 28 for the 10th wicket to give the hosts hope. Yorkshire - fresh from their victory over Nottinghamshire to claim the title - lost Adam Lyth and Gary Ballance cheaply to Thomas. The partnership between Lees, who was awarded his county cap before the start of play, and Root halted Somerset's momentum but the visitors regained their stranglehold on the game, with Jonny Bairstow, Adil Rashid and Rich Pyrah falling in single figures. Leaning's fourth County Championship half-century of the season helped the hosts past 200, as he was ably supported by a resolute Brooks. "One of the good things about being captain is seeing the young lads when they come through and see how hard they worked. "Leesy was crying his eyes out in the dressing room this morning. For a young lad he's been through a lot in his life, with the passing of his dad a few years ago. "For him to be rewarded with his county cap was quite emotional, not just for himself but for the other lads in the dressing room." "After winning the title nearly two weeks ago, Yorkshire are keen to finish in style. 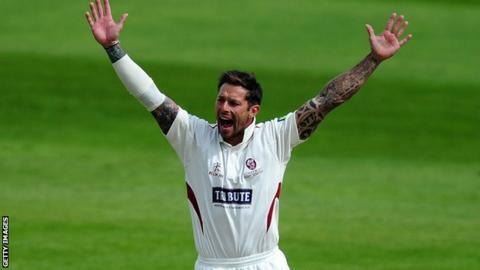 "But nobody showed opponents Somerset the script and they had the better of the first day, taking five wickets in the afternoon session. "The champions had their moments. Alex Lees continued his fine form and it was a double celebration for him as he received his first-team county cap before play started. "Yorkshire rallied well towards the end before bad light ended play early." "Somerset's bowlers stuck to their task well, against a Yorkshire side which batted with all the relaxed insouciance of having wrapped up the County Championship almost a fortnight ago. "Only Alex Lees and Jack Leaning showed any real application. How good a score is 241-9, on a worn wicket offering occasional sharp movement off the seam? "We'll discover that when Somerset's turn to bat comes round, but it may be better than it looks."